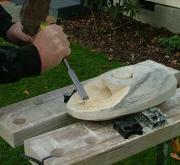 A portable workbench like the one above is one of the best working surfaces for carving stone. 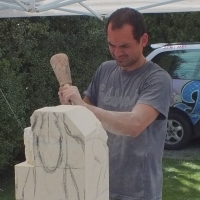 I can't stress enough that having a good, safe and stable place to work is the number one priority before you begin stone carving. I would recommend that you would need to ensure that the workbench height is adjustable to allow you to be in a comfortable position throughout your carving process. Having it adjustable means that you can set it to allow for minimal bending of your back - keeping your back safe, but if you only have a standard workbench then work with that instead. The next safety feature is the workbench clamps. 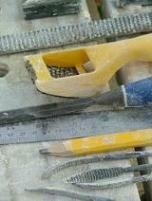 Again, this is important for carving stone. The bench needs to have a device which will lock the stone into place - thus freeing your hands and minimizing cutting yourself. Being a mobile workbench has a huge advantage over a fixed bench as you can move around and work on your sculpture from all angles. It also lets you sculpt wherever you feel inspired like being outside carving stone on a warm Sunday afternoon. Also be aware that there are many cheaper versions but these tend to be very flimsy and may not last. I recommend using this type of portable bench: When using this bench, the top surface opens and closes by winding the handles in the same direction at the same time. It is a good idea to get used how the bench works before you start working on your first sculpture. Every now and then I receive an email inquiring about where I purchased my bench from. 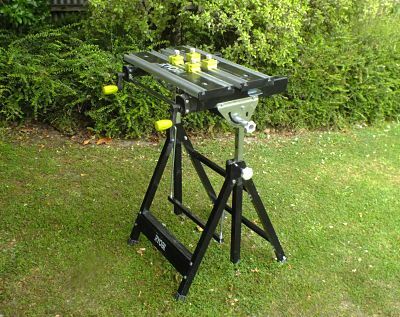 They are really hard to find because of the height adjustable feature, but just recently Ryobi has released their latest height adjustable workbench which I think stands out from others in the market.